Shark Fishing with a Dropper Rig – Don’t Do It!!! During a recent trip to St. Simons Island, I took the opportunity to get in a little inshore fishing. Since it had been a number of years since I had fished the Georgia Coast and not knowing the tidal creeks and rivers around Brunswick very well, I decided that shark fishing would provide my best chance for success. Twenty years ago when I was in graduate school at UGA, Jim Music, who used to work at the Coastal Resources Division of DNR in Brunswick, took me and a few friends fishing for sharks in Jekyll Creek, behind Jekyll Island. We were very successful that day, so, here all these years later, I felt like I could pull off the same kind of success on sharks. I rigged dead bonito with 2 hooks, because I didn’t want to risk losing half a baitfish to a short striker. Time being of the essence, my 2-hook rigs were hardly in accordance with IGFA standards and I wasn’t too concerned about the possibility of landing a new world record. After we anchored, it was only about 10 minutes until we had our first fish on. As my fishing partner, Chris, brought what appeared to be a 30 pound sandbar shark to the boat, I grabbed the wire leader and began working on removing the “stinger” hook from the shark’s mouth with a pair of pliers. Things seemed to be going well until the pliers slipped off the hook and the fish yanked the other dangling hook (which I had been largely ignoring) through my left hand. The fun for me ended at this point. Thank goodness he was only 30 pounds! I quickly pulled the fish back to the boat and started using the wire cutters to cut loose everything in sight. My only thoughts were, “It’s going to be a long grueling trip back to the launch ramp.” Chris let me drive the boat to keep me occupied, while he navigated with the GPS and monitored my state of consciousness. It took about an hour to get to the launch ramp, and load the boat on the trailer. It took another half hour to find and get to the closest hospital. In the Emergency Room, I tried to be as nonchalant as possible, while walking around with a 12/0 hook sticking out of my hand. Not wanting to freak out the other patients in the ER, the receptionist quickly scuttled me back to the triage area. The Physician’s Assistant who treated me was from Kenya and spoke English with a heavy accent. He did provide me with an opportunity to ask “Unasema Kiswahili?” which is not something I’ve used very much since learning the language skills necessary to be an African professional big game hunter at White County High School in 1982. He told me that he expected it would take quite a while to SAW!!! 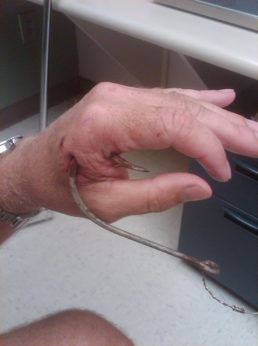 through the hook sticking out of my hand. The PA came back in a few minutes and began using the syringe with reckless abandon. The impalement by the hook was nothing compared to being worked over by that syringe. My hand literally blew up like a balloon with all the Novocain under my skin. As my Kenyan friend left the room, I sat there with cold sweat beaded up on my balding forehead, waiting for his return. When he came back a few minutes later, he carried in his hands something akin to a battery powered Dremel tool with a diamond saw blade attachment. He worked about 5 minutes carefully cutting through the hook above the barb. He then rounded the rough edges and backed the hook out of my hand. Finally, I was free! The nurse then produced another huge syringe full of Betadine (thankfully without a needle this time). My PA squirted the equivalent of several shot glasses full of the reddish brown liquid through the back of my hand until it ran out my palm. He blotted everything off, gave me a most lovely Tetanus shot, and prescriptions of antibiotics and pain killers. He told me not to bandage the hand, unless I risked getting it dirty, because he wanted it to “weep”. Despite my description of the events in the ER, the staff at the Brunswick Campus of the Southeast Georgia Health System all did an excellent job. My poor attempts at making light of the situation were all anxiety and shock induced. Thanks to their efforts, I was able to pick up where I left off without missing a thing. I spent the next 3 days masking my hand and walking around with a pocket full of surgical gauze. Despite a swollen hand, I felt good enough the evening of the next day to try it again. We didn’t catch any fish, but I did learn that SeaTow charges $300/hr. to come and get you when your boat breaks down. That’s another story for another day. In the meantime, if you would like for me to take you shark fishing on the Georgia coast, please give me a call! Living the Island Life! Eleuthera Style! How Your Next Reel Will Be Made!